When you’re a one man bike building operation you have to be a master of all crafts and failure at none and that’s not as easy as many believe it to be. You take some of the world’s greatest chefs and put them front of house dealing with complaint filled customers and before you know it Gordon Ramsay is on murder charges. 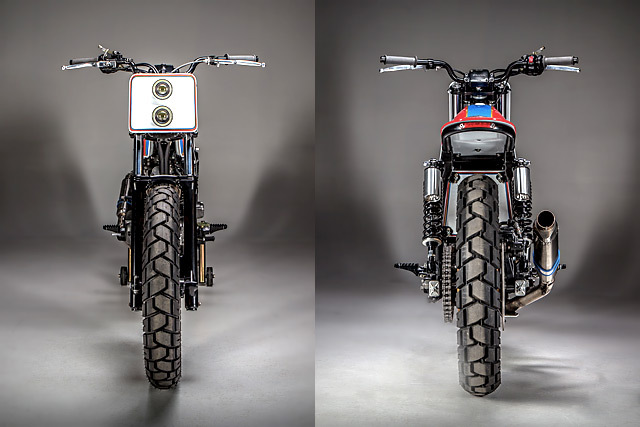 But Sean Skinner has made MotoRelic Custom Cycles in Hamilton Virginia a success by combining his 20 odd years of mechanical and fabrication skills with the design skills of a sculptor and a friendly attitude to customers no matter the job, big or small. 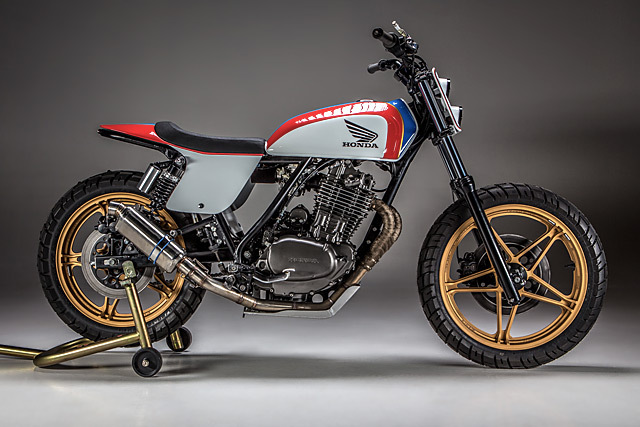 With some room in the shop he picked up this 1982 Honda Ascot FT500, tore it down to a bare frame, stood back and let the design come to him. But let’s be honest, with or without its clothes on the FT500 is no Statue of David or Brough Superior and those long skinny forks have all the grace of a gangly and uncoordinated 15-year-old. So Sean grabbed a ratchet strap and cranked them down 4 inches, stepped back again and finally saw a vision of what he would create. 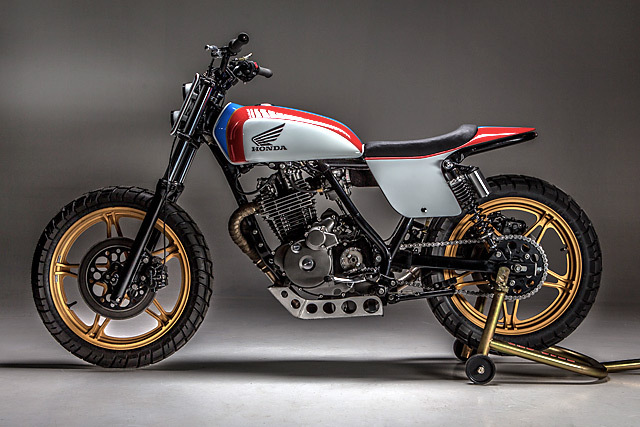 What he saw was a full on Honda Street Tracker all dressed up in factory race colours, the sort of bike that Honda should have built themselves had they wanted sales success. Because two years after it’s release dealers still hadn’t cleared the original shipments of FT500’s and were giving them away at half the recommended retail price. But with his design on his mind Sean got straight to work, cutting down the frame, removing the rear rails and taking off all the unnecessary tabs. With a clean canvas he bent up a new rear hoop and welded it in place before beginning the process of hand forming the aluminium tail section. To get the true Honda racing heritage look just right he added number plates each side and the quality of the fabrication work would make the factory metal shapers of old proud old lads. With the tail complete it was time to make a place to sit and a rough foam cut out was placed on the bike before Sean began the messy task of sanding it down till he had it just right. With the look he’d created so far the truly awful factory tank just wasn’t going to cut the mustard but a Suzuki TS250 item was much closer to having the right appeal. Putting his fabrication skills on display again Sean cut metal from the bottom, added more to the sides and then fabricated new mounting points so the tank sat on the frame at the desired angle. Then there is the front number plate and while there may be some that are as good, I’ve yet to see one that is better. This is not a plastic unit, moulded by machine and bought from a shop to serve a particularly fit. But a one-off, hand formed, piece of aluminium that takes detailed fabrication to a new level. Not only are the edges rolled, lipped and then curved at each of the four corners, the cut outs for the headlights are fully three-dimensional pieces. Rather than simply mount them flat the metal work embraces them like a cup, for a softer, smoother look that with the ultra bright LEDs fitted is as impressive front on as it is from a side view that reveals just how good a metal worker Sean is. 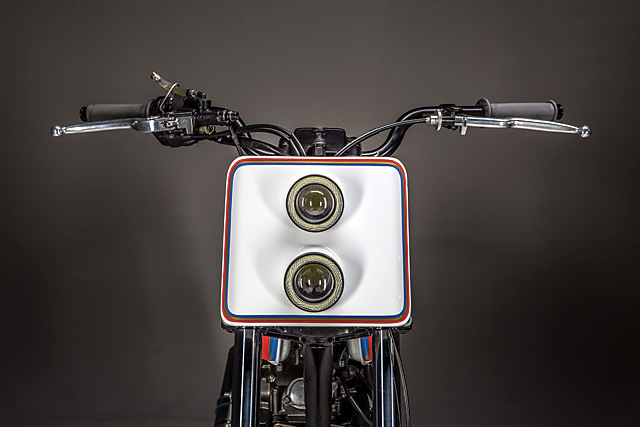 The simplicity of the remainder of the front end, with tracker bars, a single switch block and adjustable levers allows the plate and the rest of the metal work to truly take the centre stage it so richly deserves. The stunning paint has been laid down by the uber talented Craig Rutler of Homeward Bound Cycles in Woodbridge Virginia who does all of this without a paint booth of his own! 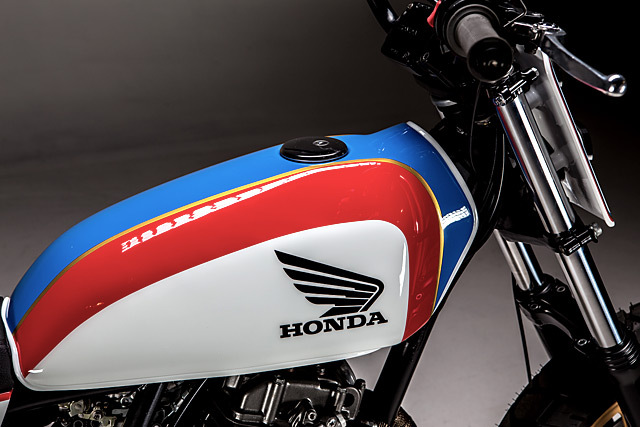 The Honda Factory Racing colours have been applied with the same level of artistry Sean used to create the tins. 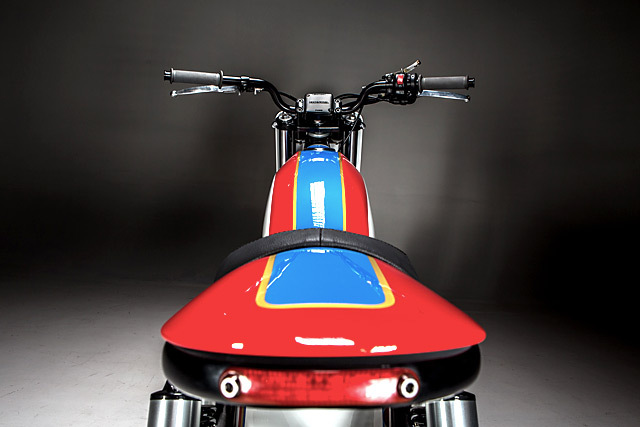 Crisp white is the primary colour but by no means dominates the visuals with Honda’s red and blue used across the top of the tank and along the rear section of the tail. All of which is broken up by remarkably accurate pinstriping in gold, with the period correct Honda wing logo in gas cap matching black. Craig then pulls all of his tricks together on the front number plate with the white further softening the curves of Sean’s metal work and then a triple layer of pinstriping creating a border to frame out the twin headlight setup. The stock wheels now wear the same gold as used on the body work and look markedly better than they do in the black and brushed alloy look they wear from the factory. 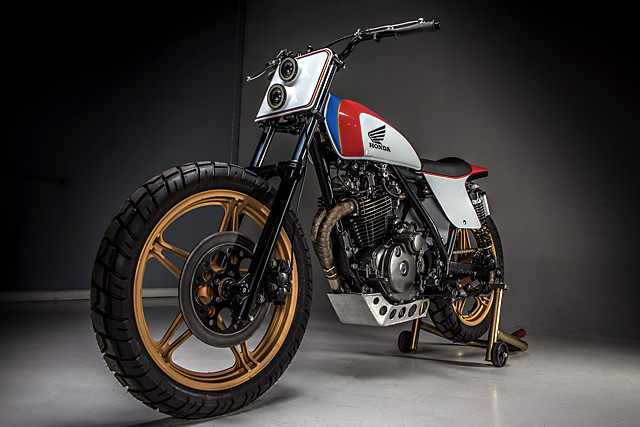 Finding the right tyre for a Street Tracker is ultimately a compromise between a tough enough look and versatile functionality and in Shinko’s 705 tyre, a dual sport design, Sean has got the balance just right. But back to the front suspension that started the inspiration and it’s been shortened to the same 4 inches that was achieved when first cranked down with the ratchet strap. While out back there is a huge improvement thanks to the fitment of fully adjustable shocks with remote reservoirs and progressive rate springs. With the FT now considerably closer to terra firma Sean made the wise decision to put his fab skills on show again by constructing a bash plate from aluminium. When it comes to a stock FT500 its real trump card is the engine, not something you would expect to say about a 34hp air-cooled single. But the XR/XL derived powerplant is not one you can judge from the tech sheets, the 497cc single cam, 4 valve is simply a joy with thumping gobs of torque right across the rev range. Unlike most of the singles at the time the FT got a starter motor which is fired into life thanks to the remarkably powerful yet small Shorai lithium battery that hides under the seat. With the engine stripped down it was treated to a new set of gaskets and seals before Sean gave it a new coat of paint and a stainless bolt kit for an ultra clean look. The carb breathes through a Uni filter foam pod but it’s the exhaust that creates all the good noises. 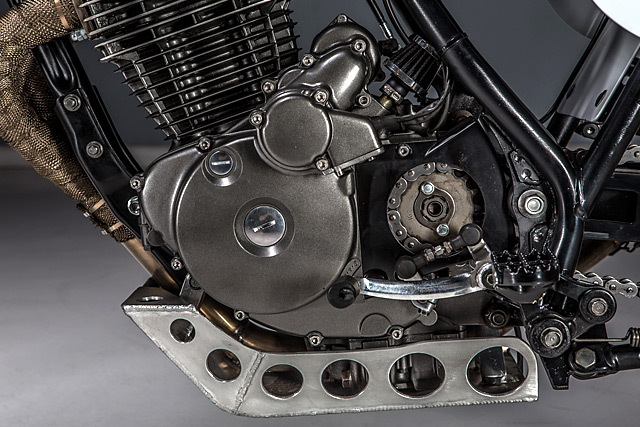 The brilliant hand-made full stainless system is wrapped where it exits around the downtube before finishing out in a muffler that is the perfect mix of looks and banshee wailing, traffic stopping scream. “After final assembly the anticipation was huge! It started right up and damaged my hearing in the garage. 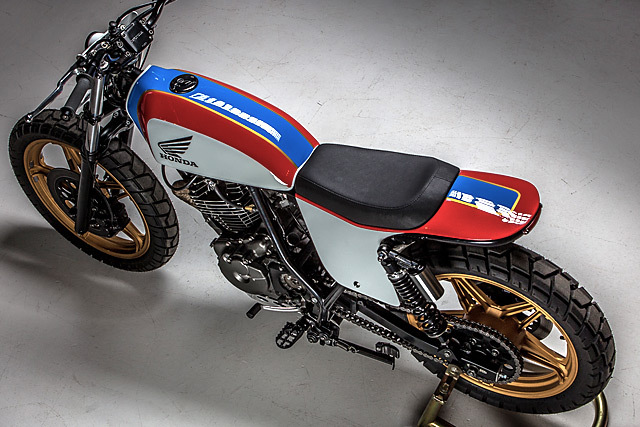 The sound is comparable to a modern CRF450. Loud. The ride is fun and the bike is so light and easy to ride.” He may not be one of those world-famous Chef’s with their notorious tempers but Sean Skinner has cooked up one hell of an appetising meal from the plainest of ingredients. 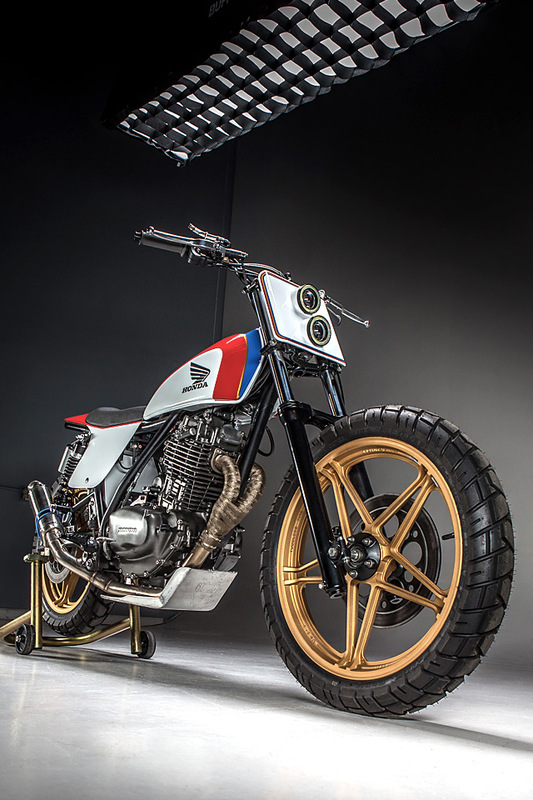 From the man who can do it all, it’s no wonder that MotoRelic Custom Cycles just goes from strength to strength no matter the dish he’s asked to prepare!